Click here for the Old Testament Puzzle Pages. Click here for the New Testament Puzzle Pages. Sundays provide great opportunities for children to learn more about the Bible and God. Although it is the parents' responsibility to train children in God's ways, Sunday schools and church services can be powerful ways for children to learn and grow. Many churches provide developmentally appropriate classes for children, such as Sunday School. Fewer churches have children's church, or a church service for children that is an alternative for "big church" or the regular church service. Many churches allow children to attend church with their families once they enter kindergarten. While this is a great opportunity for children to worship God with their families, the sermon portion of the service can be a challenging time for young children. Although it would be ideal for children to learn from the sermon, it is developmentally inappropriate to expect young children to sit silently for extended amounts of time while a speaker talks about topics that are often complicated or even of a mature nature. Puzzle Pages are an option for parents who want their young children to benefit from the sermon time, but whose children have a difficult time staying quiet, still, and focused for extended amounts of time (which is acceptable and even expected for young children). Puzzle Pages are activity pages for young children that can be completed quietly during the sermon, but have Biblical value. Instead of doodling, coloring in a coloring book, or finding all of a particular letter in a church handout, children can complete these fun activity sheets. Puzzle Pages are based on Bible stories. They have both academic and Biblical benefits. Not only are they appropriate for beginning readers and can help develop reading skills, they reinforce what was taught in Sunday school. Simply find out what story will be taught at your church and check the Puzzle Page archives to see if there is a matching Puzzle Page for the story your church is doing. Check the Puzzle Page archives often; files will be added frequently. Older children are able to listen to the sermon and learn from it. 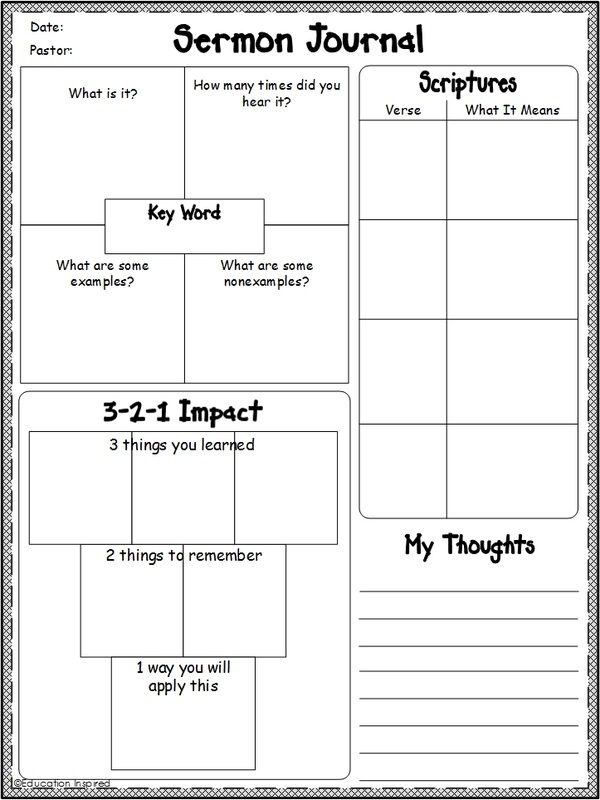 Using this Sermon Journal will help them focus, make connections to the sermon, and remember what they learned. Print several copies and just grab a blank one each Sunday. Explain the Sermon Journal to the child before the service starts to make sure the child can complete it without help during the service. As an added benefit, these strategies are drawn from research-based reading strategies that support the development of reading skills. Not only will your child be growing spiritually, but your child will also be improving his or her read skills. Vocabulary: Write the Key Word in the middle box. In each corresponding box, write a definition, make tally marks every time the word is heard, write/draw an example of the word, and write/draw a nonexample of the word (something it is NOT). Scriptures: When the Pastor references a particular verse, write down the reference on the left side. Write what the verse means on the right side, or a important thought about the verse. 3-2-1 Impact: Fill in the boxes. The top row is 3 things learned. The middle row is 2 things to remember. The bottom box is 1 thing to apply to life or to do. My Thoughts: Write connections from the sermon to life, feelings about a new idea or a point on the sermon, feelings about a particular verse, or anything else that the child feels is important. You can follow-up with your child on the way home from church. Have your child pick one or two things from the journal page to share with you/the family. Things to Remember: Record any ideas, points, or thoughts that should be remembered. Questions: Write down unknown words or anything that is confusing. You can follow-up with your child on the way home from church. Have your child pick one or two things from the journal page to share with you/the family. You can also follow up about the things that were confusing. 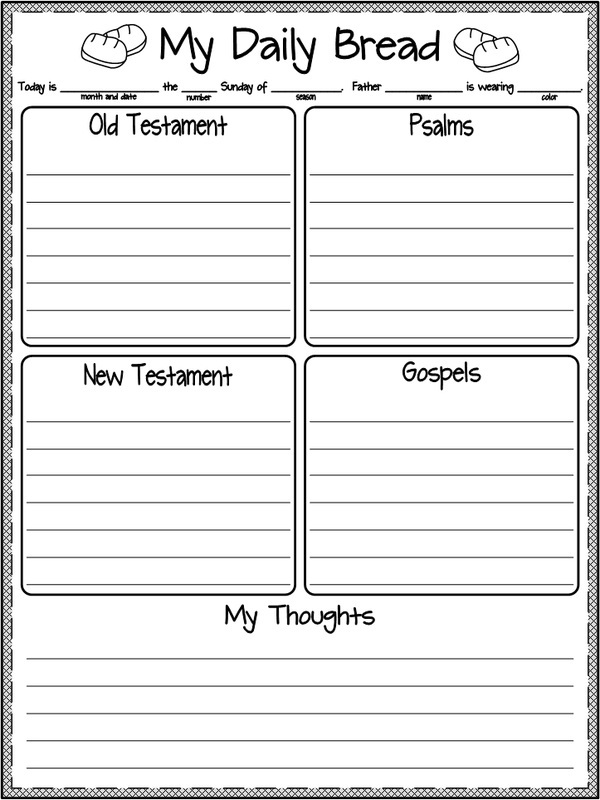 This page was designed for children who can already write so they can record a service's Scriptures and their reflections about the Scriptures. 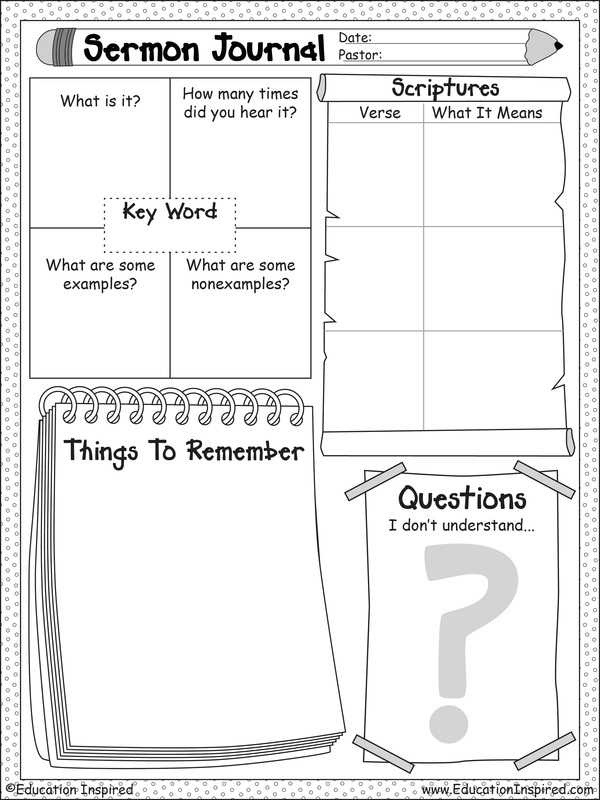 This will help them focus during the service and make connections to what is being taught. This is designed for Catholic services.